Unique curved design adds style to any location! Silver finish coordinates with any décor! 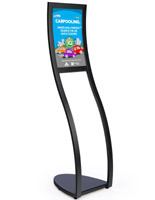 Non-glare lens protects poster from damages and ensures a clear view from all angles! These sign frames feature a beautiful 'S' shaped design with a half-elliptical base. 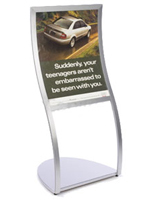 The frames are perfect for displaying advertisements in a lobby, or specification sheets in a car showroom or museum. 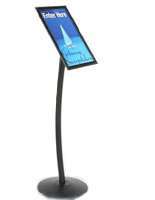 These sign frames, also known as poster stands, could also hold a menu in a restaurant waiting area or directory listing in a mall or shopping center. 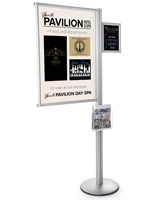 The unique curved construction and satin silver finish of these sign frames adds just the right touch of elegance to any setting. 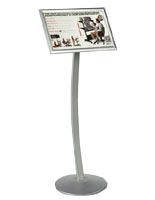 These floor-standing displays, sign frames are very practical, considering their upscale design. 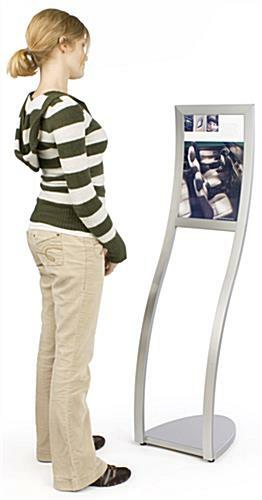 The frames feature a graphic window to hold 11"w x 17"h graphics, posters, advertisements, menus and more. 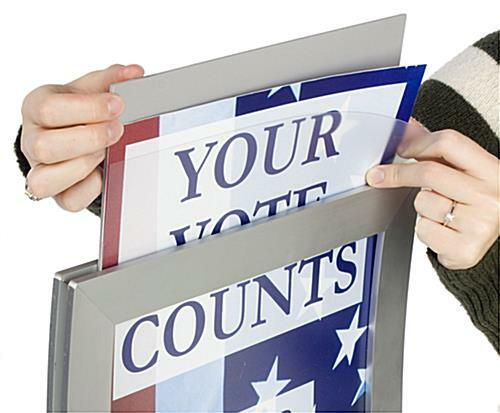 A slide-in channel ensures graphic changes can be completed in just seconds; no unscrewing, snapping open or other steps necessary. Simply slide out your current graphics and slide in your new poster or advertisement. 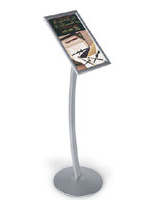 These sign frames come complete with a sturdy expanded PVC backer and non-glare protective lens. 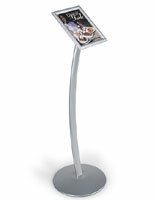 This lens ensures your sign is viewable from all angles and also protects it from scratches or spills. 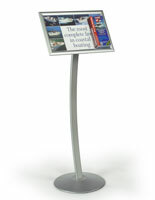 Sign frames ship knocked down to save shipping costs but assemble in just minutes. 13.8" x 52.5" x 16.5"
I am very impressed with the look and style of this sign. It is good quality and easy to assemble. I love the versatility of being able to change out the insert as we need it for different events. Very nice looking and sturdy sign. No worries of it falling over as our previous one did. Reasonable price for product. Best product I found online. Thanks for the great review, Leslie! We're so glad these work so well for you. We hope you shop with us again soon!